Wise Child by Monica Furlong was released in 1989, so it wasn’t around when I was a kid. It was recommended to me by one of my young fans. She said it was one of her favourites. I think if I had read it when I was 12, I would have put it at the top of my list too. I probably would have dreamed of having a life like Wise Child. 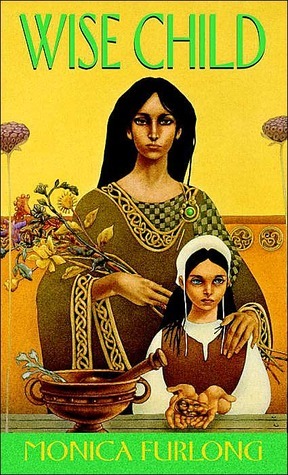 Summary: When Wise Child’s grandmother dies, there is no one in her small Celtic village who will take her in. Her father is away on a long sea voyage and her mother abandoned her. She is taken in by Juniper, who lives outside the village because she is a doran (a healer / sorceress) and the conservative religious villagers don’t accept her. Many fear her, but there are those who rely on her healing services, so the villagers leave her along. Wise Child is also afraid of Juniper due to the wild rumours of her witchery the village kids spread. Over time, though, under Juniper’s patient care, she learns to trust her. Wise Child is a bit lazy, self-centered, and moody but in every circumstance Juniper remains calm and understanding. Juniper teaches Wise Child to read and write. She also teaches Wise Child herbology and how to respect all living things. Their bond is tested when Wise Child’s manipulative mother enters her life again. Maeve is also a sorceress, but uses her powers for greedy purposes and wants Wise Child to join her in her palatial estate. Wise Child is left to decide which life she wants, tempted by the attention her mother suddenly takes in her. Meanwhile, the village priest is becoming increasingly intolerant of Juniper’s presence and is rallying the villagers against her. Ultimately, Wise Child will have to determine where her heart, and loyalty, lies. Wise Child is a lovely coming-of-age story. It’s a slower, softer fantasy. It’s not full of fast-paced sorcery battles, but rather explores in a very believable way a young girl learning to be her own person. The witchcraft is more about connecting on a spiritual level with the living world. I really liked the authenticity of Wise Child’s struggles. Like most children, she doesn’t like hard work, but she slowly begins to see the value in it over the more pampered lifestyle offered by her estranged mother. My only criticism is that Juniper seems a bit too “perfect.” This has always been a pet peeve of mine. Perhaps when I read the prequel (Juniper) I will change my mind about her. I liked her as a person, I just didn’t get a sense of any of her own struggles. She is so even-tempered it became a bit unbelievable. I think kids will relate to Wise Child in a way they might not in other fantasy books. There is also a 3rd book in the series (Colman)that was written over a decade after the second one. CLICK HERE for more Middle Grade Mondays posts. I haven’t heard of this one, and I enjoy discovering books published not-so-recently that are well-thought-of. Thanks for highlighting this one. I hadn’t heard of it either until my young fan mentioned it. It’s a short book, easily read in one sitting. I’ve been meaning to pick up the prequel. Thanks for the review. I will look up Wise Child. Hello! Thanks for leaving me your link on my blog, and for stopping by the check out my art! I just re-read the Phantom Toll Booth after the conference and loved it as much as I did reading it when I was younger. Thanks for the thoughtful review. Also I enjoyed your review of the Magician’s Elephant, one of my favourites. Great site, I will definitely be back to check out more! Hi Kiersten! Isn’t Magician’s Elephant beautiful? Did you read Edward Tulane as well? As an artist, I would think seeing those books would give you inspiration. Your work is so lovely if it’s not in a children’s book already, I know it will be.